Want yet another reason to justify upgrading to Blu-ray sooner rather than later? Consider this: Criterion, that haven for cinephiles and loyal devotees of world cinema, has finally ventured into the high definition market. Their first release, Wong Kar Wai's Chungking Express (1994) is a great example of how an emphatically cinematic work of art should be transferred for viewing in the high-definition digital home video realm. There is the beautiful, newly restored picture to best illustrate the care with which they've approached Chungking. While Wong (In the Mood for Love) and cinematographer Christopher Doyle always provide arresting images full of saturated color and painterly composition, this film was shot under hurried circumstances, stolen shots necessitated by their inability to obtain permits for most of the film locations. Understandably then, they resorted to natural light for much of the shoot, and film grain has always been evident in the movie. Obviously then, it only heightens the gritty style of what is one of Wong's most spontaneous exercises, a diptych concerning two cops and their respective travails with love in Hong Kong, with the upcoming transfer to mainland China looming over the city. Happily, I can report that Criterion has preserved the telltale grain to such an extent, it almost looks like you're watching film, not video, in your living room. This is a pernicious bugaboo to many film buffs and I'm not surprised at Criterion's response. The soundtrack has also been remastered in DTS-HD Master Audio 5.1. Little flashiness here with most of the audio coming from the center speaker, but wonderful ambient noise from the rear speakers when the locale changes to the marketplace at Chungking Mansions. Of course, Criterion enlisted director Wong's aid in supervising the transfer according to the slim and elegant cardboard Digipak that holds the disc. What the box doesn't say, but Curtis Tsui communicates in Criterion's blog, On Five, is how they managed to rework some changes suggested by Doyle at the eleventh hour, after a rare opportunity to catch the cinematographer in New York where he was shooting a film for Jim Jarmusch. Asian cinema expert, Tony Rayns of Sight and Sound magazine, provides an excellent commentary that is very informative. Especially enlightening is a discussion of the, at times, fractious relationship between Doyle and Wong, more credible because of his close personal friendship with Doyle, and his expertise with Wong's filmography. Best of all, Criterion plans on keeping the price point the same for their Blu-rays as it is for the standard DVDs, making it a virtual given that one should purchase the high-definition version. So give yourself two presents for Christmas, a great Blu-ray player (I viewed it on a Sony BDP-S350), and Criterion's Chungking Express on Blu-ray. 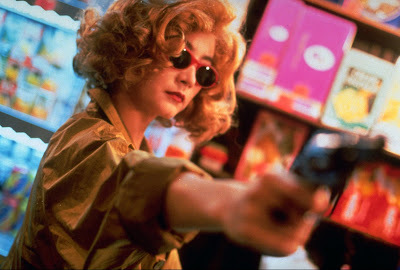 Chungking Express will be available, on Blu-ray and standard DVD, on December 16th. Stills provided courtesy of Buena Vista Home Entertainment and The Criterion Collection.